Includes pre-installed 3/8 NPT to AN6 outlet fitting. 1/4 NPT tapped hole for 458400 vent valve. 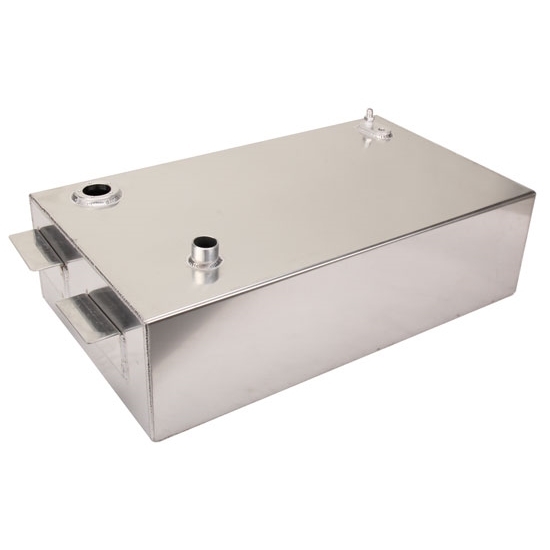 These 17 gallon aluminum fuel tanks are designed to be mounted under your pick-up box. The 1-1/2" filler neck will require a remote filler neck or fuel filler door in the box floor. They DO NOT accept the original truck fuel sending unit, but do accept the common 'non-side swing specific' sending unit provided with aftermarket gauge sets. A 'non-side' swing specific 240 empty - 33 full ohm sending unit such as # 458-8240 or 275-235 can be utilized. Measures 28-1/4" x 16-1/2" x 8".